Growing up in a Filipino Catholic family, eating fish and vegetables on Lenten Fridays was a tradition for us. My brother and I were both in Catholic schools that time so we knew the importance of observing this tradition and we never complained about it. Sinigang na isda, paksiw na bangus, sarciadong isda, bulanglang, cardillong isda, daing na bangus, ginataang isda, escabeche, fish pochero, totsong isda, and pesang tilapia were among the dishes that my mom usually cooked during the Fridays of Lent. 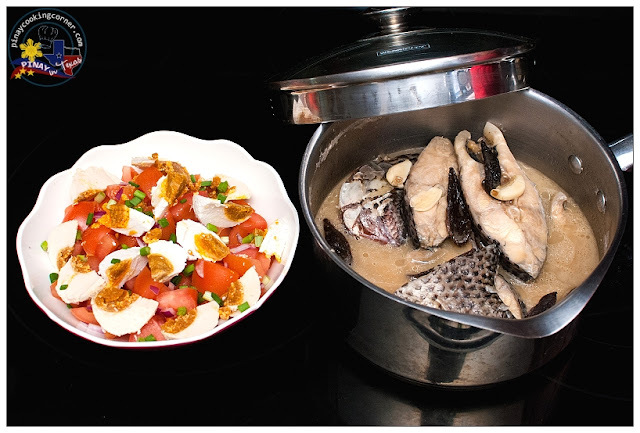 When she was busy and didn't have much time to prepare dinner, we'll find either fried fish served with itlog na maalat (salted egg) salad or Sinaing na Isda which was usually tulingan (baby skipjack tuna) on our table. 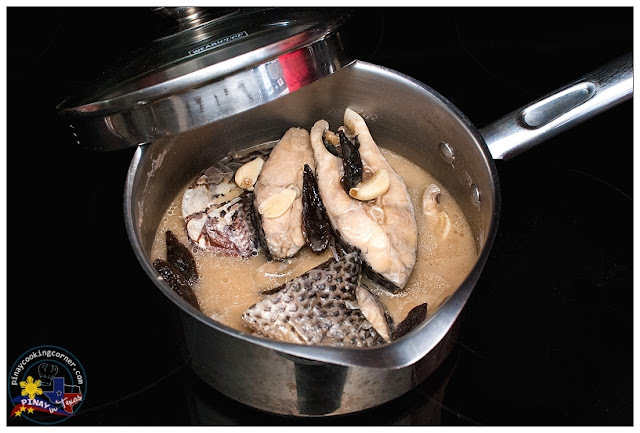 Just like fried fish, Sinaing na Isda doesn't need too much time to prepare. You just season the fish with salt, put in a pot with water, dried kamias and fish sauce and cook "boiled style like that of rice" for 30 minutes. Despite the simplicity and mild flavor of this dish, it's something that I always enjoy eating. I rarely find tulingan here in my side of the world, so I often use tilapia whenever I cook Sinaing na Isda. I must say, it's nothing similar to the dish I grew up loving, but at least I get to satisfy my craving for this Batangueño dish. The last time I cooked it, I have some salted eggs so I served the Sinaing na Isda with salted eggs salad. 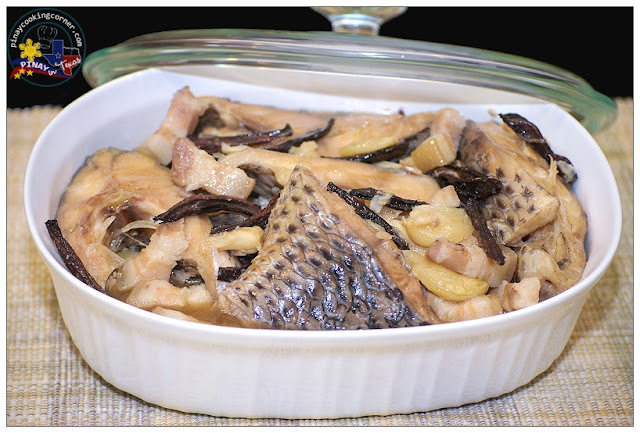 Sinaing na Isda is usually cooked with pork fat for added flavor. But everytime I cooked this during Lent, I omit the pork and just substitute it with vegetable oil. While some cook it with soy sauce and vinegar, I prefer mine with kamias, garlic and fish sauce. This is how my family like it...you should give it a try! 1. Sprinkle fish with salt and let sit for about 15 minutes. 2. 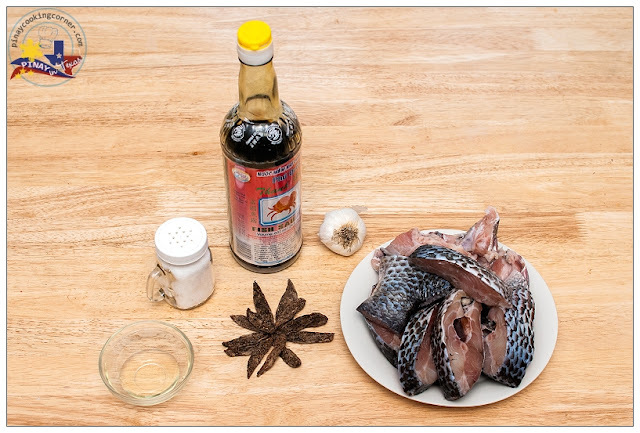 Arrange pork liempo (if using), half of the garlic and the dried kamias at the bottom of a saucepan. Arrange fish on top of it and then add the remaining garlic and kamias on top. Pour water, oil (if using) and fish sauce onto the fish. Cook over medium heat for about 30 minutes. Stir and season with salt if necessary. Remove from heat. Allow to cool down a little. Serve with steamed rice. Delicious tilapia Tina, it become great meal. I like to cook it with kamias as well though as always , haven't cooked it for years :P Your salted eggs with kamatis is very appetizing and really goes well with that very delicious sinaing na tilapia ! We grew up exactly the same except I grew up in a Cajun French Catholic family and love Seafood Fridays! yummy.makes me want to eat my lunch now and to think that morning in the office has just begun. awts! I support the pairing with salted eggs. How can I say no to pinching into the salted eggs while enjoying this fish dish. Nice and glad to see your recipes which suits our taste. These days I use Swai (similar to catfish) quite a bit. It is never fishy tasting and boneless. :) www.low-carb-news.blogspot.com Thanks! This is usually what we call, Perfect combination. And it is best eaten with lots of rice, for me that is! Anyway, I suddenly miss my Mom when I read this entry. She makes an awesome version of this. Brings back great family memories. More power to your entries ms. Tina!